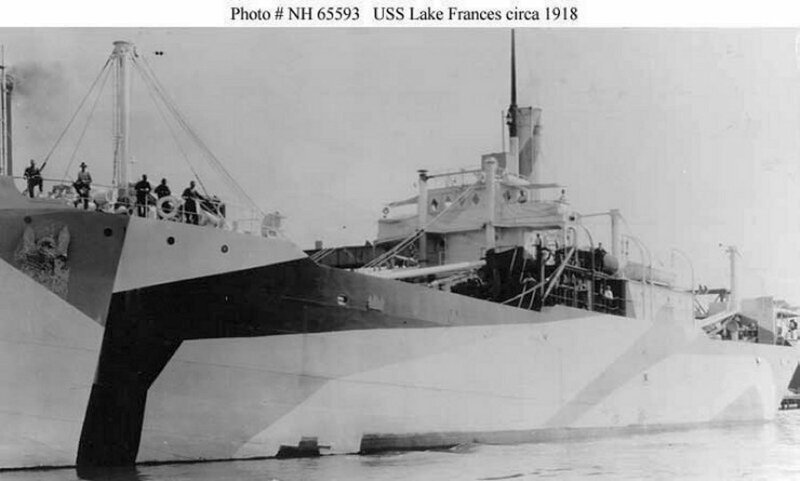 Freighter: Built in 1918 as J. W. McGrath by the American Shipbuilding Co., Toledo, OH; Renamed Lake Frances while under construction; Acquired by the Navy 1 August 1918 and commissioned USS Lake Frances (ID 4406) the same day; Decommissioned, 23 September 1919 and returned to the United States Shipping Board; Reportedly sold to Richmond & New York Steamship Co., in 1920, then repossessed by U.S. Shipping Board; Sold in 1926 to the Ford Motor Co. of Detroit, MI; Sold in 1928 to Frank Paramino of San Francisco, CA; Sold in 1936 to the Coastal Steamship Co. of San Francisco; Sold in 1946 to the Lee Che Co. of Shanghai, China and renamed Lee Hwa; Dropped from the merchant vessel registers in 1968. Fate unknown. Specifications: Displacement 1,190 t.; Length 261'; Beam 43' 6"; Draft 19'; Speed 10.5 kts. ; Complement unknown; Armament one 4".